Rachel (Salciedo) Prudente died unexpectedly in her resident on July 2, 2018 in Beaver Dam Wisconsin at the age 63. Rachel was born on December 19, 1954 in Fresno California to her Parents Gustavo Salciedo and Rosenda Morales Salciedo. Rachel worked in Retail for 10 years. She was a volunteer for Queen of the Valley Hospital for 2 years and loved helping the elderly. She loved Music Oldies, Spanish & Reggae, She loved BBQ with family at her sister Erma and Ernie’s home in Napa. She loved dancing and working on puzzles. She loved reading and watching true stories movies. Rachel moved to Beaver Dam April 2014 to move with her son Benji to help him raise his son Benny. Rachel is survived by her father Gustavo A. Salciedo Sr. in San Diego. 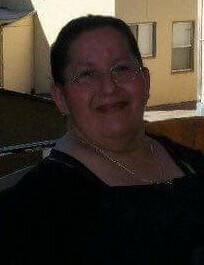 Rachel has 3 children, her daughter Delia Behm and husband Mark (Paco) Behm of Fairfield, CA, son –Arsenio Prudente and wife Rebecca Prudente Beaver Dam, Wisconsin, son-Benjamin Gonzalez in Beaver Dam Wisconsin & son (Decease) Angel Gonzalez, Rachel has 12 grandchildren, Regina, Reina, Pebbles, Eddieboy, Benny, Violet, Tianna Ashlee, Aaron, Adriana, Malia, Ryan, and her Yorkie Zoey. Rachel is survived by 9 siblings, (Sister)-Rosemary and Husband Juvencio Ruiz from Vallejo, (Sister)-Marylou and husband Luis from Bakersfield, (Brother)- Gustavo (Jr)Salciedo from Napa, (Sister) Lola Salciedo from Vallejo, (Sister)-Cricket Salciedo-Banelos from Suisun, (Brother)-Andy Salciedo from Napa, (Brother)-Alex Salciedo from Vallejo,(Sister)-Erma Ramirez from Napa, (Brother)-Jesse and Wife Mary Bonillos from Tulare. Rachel has 33 nephew and nieces and 67 great nephew and nieces and 42 great great nephew and nieces she was loved by all . A Rosary Memorial Service is scheduled for 10:00 AM August 18, 2018 at Tulocay Cemetery, 411 Coombsville Road, Napa, CA, 707-252-4727. With a reception to follow all are welcome to attend and celebrate Rachel (Salciedo) Prudente life.